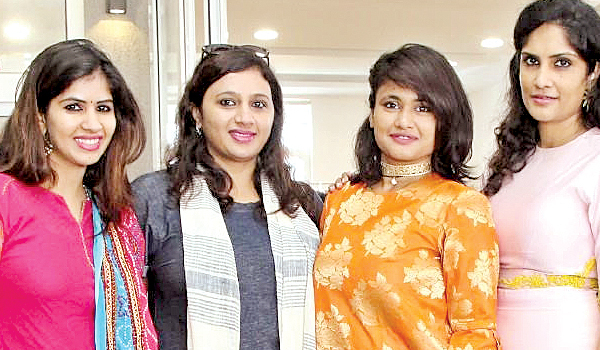 The festive season kick-started in the city with Sushila and Anita from Phankaar Ladies Club hosting a pre-Navratri celebration at hotel The Manohar. Socialites such as Neeru Mohan, Renu and Shalini dressed up to the hilt in their ethnic ensembles and enjoyed themselves as they danced to the garba beats. The colourful ambience and music made the evening all the more memorable. The guests also walked away with goodies from the do. At the American Food Fiesta organized by the U.S Department of Agriculture (USDA) at Taj Banjara, socialite and chef Ruchika Sharma was spotted displaying her culinary skills. She rustled up some delicious waffle and they couldna��t stop raving about it. Designer Shilpa Reddy was seen in a black off-shoulder crop top with a subdued monochrome skirt at the inauguration of Haute Affair Exhibition curated by Sashi Nahata at Park Hyatt. Several well-known faces from the city such as Anju Jain, Aakansha and Swati attended the do. Another exhibition called Vastrabaranam was hosted by Sirisha Mulpuru at Yuktalaya, Kavuri Hills. Around 12 designers from the city exhibited an eclectic range of silk handloom outfits, A�an array of exquisiteA�kurtas, dupattas, and accessories. Apart from the prA?t-A�-porter and accessory collection, there was a sumptuous spread of brownies and chocolates. Tamanna, Aarti, Komal and many more were spotted shopping at the do.